The Fairmont edible garden was previously an unused, ivy-covered plot located outside the kindergarten classrooms. Thanks to the vision and hard work of parent volunteers and teachers, the garden is now transformed into an outdoor classroom that allows for hands on science exploration and education to take place in school. The garden also enabled the PTA to carry out an after school gardening class that gave kids hands-on experience in composting, soil building, seed starting, planting and garden art. Students also participated in the recycled art in the garden exhibition in June of 2008. The successful harvest of pumpkins, sunflower seeds, beans and tomatoes, has motivated the school to organize a second school-wide solar cookout in the middle of October, 2008. The garden activities tie in to help students understand our role in the ecosystem. 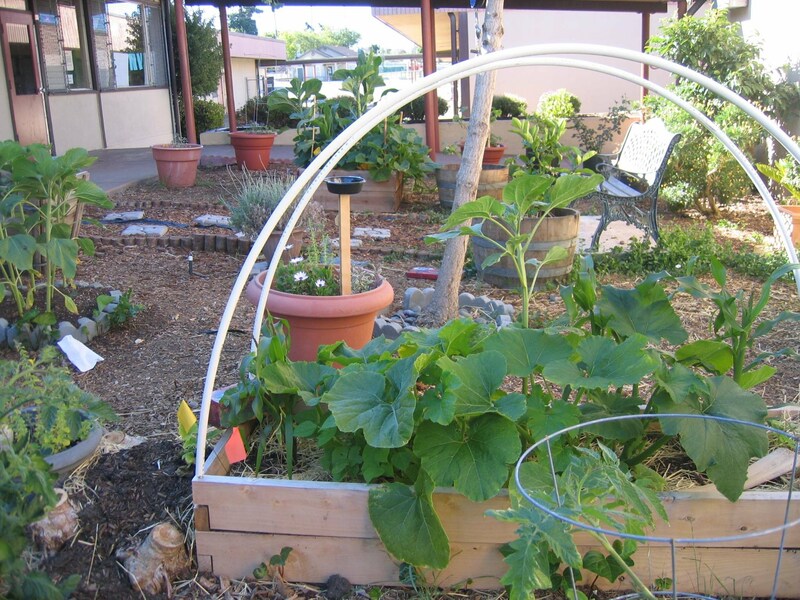 With the cooperation of teachers, the PTA would like to expand the edible garden – focusing on starting an insect habitat, plant diversification and composting – so as to increase its value as an outdoor classroom to support academic standards in science, language arts and math skills of Fairmont students. If you love gardening and would like to see our garden succeed and expand, please contact us at gofairmont@yahoo.com. We need help with simple weeding and watering on a regular basis. If you have gardening expertise, we would love to hear your ideas and get you involved in our gardening team. Click here to Join the Fairmont PTA! Choose the Annual Membership item and when adding to your cart, be sure to include the grade and room of your child! All contents © Copyright 2010 - 2019, Fairmont Elementary PTA. All rights reserved.